“That glorious vision of doing good is so often the sanguine mirage of so many good minds.” Charles Dickens, A Tale of Two Cities. As kids, most of us have athletes, movie stars or singers as idols. As we grow up and see the world from a different perspective we start to appreciate more the people who invested their time and energy to really make a difference. And some of the today’s leaders are entrepreneurs that influenced the world: Bill Gates, Gary Vaynerchuk, Steve Wozniak, Elon Musk, Jeff Bezos and many more. It’s reasonable to say that people will go the extra mile to meet their idols, so having a well-known leader on your speakers’ list will generate more interest for your event. 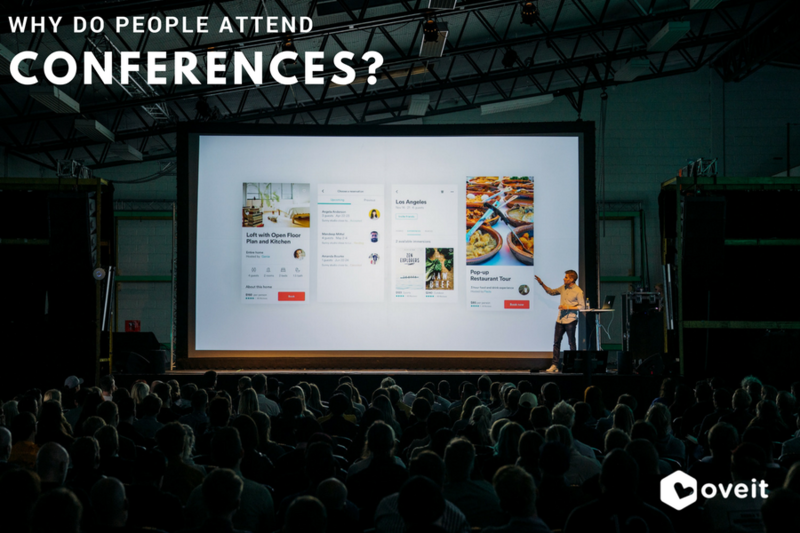 Conferences offer great networking opportunities, and many attend them just to find themselves surrounded by people with similar interests. A great way to encourage people to attend your conferences is to communicate the demographics of your past audiences (or if this is the first edition to make it clear to whom you address your conference). People hope to meet new customers, partners or even mentors at a conference, so let them know that this is possible. Event badges will work as “icebreakers” within events, this is why we developed an app that allows #eventprofs print beautiful personalized badges – on the spot! If you think that the internet is full of new ideas…you’re right. But I can bet that every speaker has some great ideas that he keeps for special occasions, and speaking in front of hundreds (or even thousands) really sounds like special. Not to mention that the emotion of hearing it LIVE from your idol will make it very hard not to apply it; so conferences also work great in those moments when we lack not ideas but the motivation to apply them. The only 100% secure investment is the one made in yourself. Today, more than ever, we live in a world where everything is possible and knowledge can break any barrier. Education offers us the chance of a better life (and the possibility to make the world a better place) and the Internet offers the opportunity of showing the world what we are capable of – with just a few clicks. People attend conferences because they see them as a great investment in themselves and self-investment is the key that will open any closed door. Create your event around powerful new information and your target audience will want to attend it. 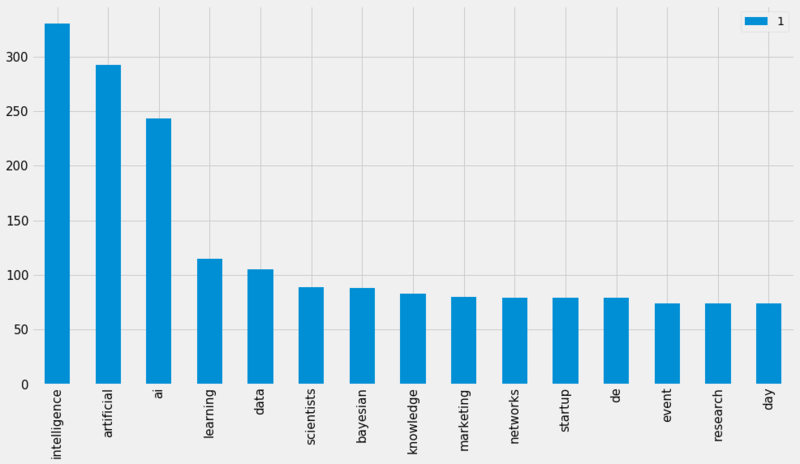 These are some of the main reasons for which people attend conferences. But it’s important to remember that the overall experience will determine if people will come to your future events or not. Apart from some cultural differences (that we all should accept and appreciate) we all want the same things when planning to attend a conference: to buy tickets with fewer clicks (remember that any extra step is a barrier that your possible attendee needs to overcome); to avoid queueing (cashless payments systems based on NFC really changed waiting times at big events; innovation (technology makes it easier for you to engage your attendees, making them feel important and appreciated – which they are); valuable information – the main reason for which people will attend your conference. Do people STILL buy Museum Tickets? So what is happening here? Why does KHM have 4 times less reviews than the Schonbrunn Palace? We did a little digging and found some interesting things. 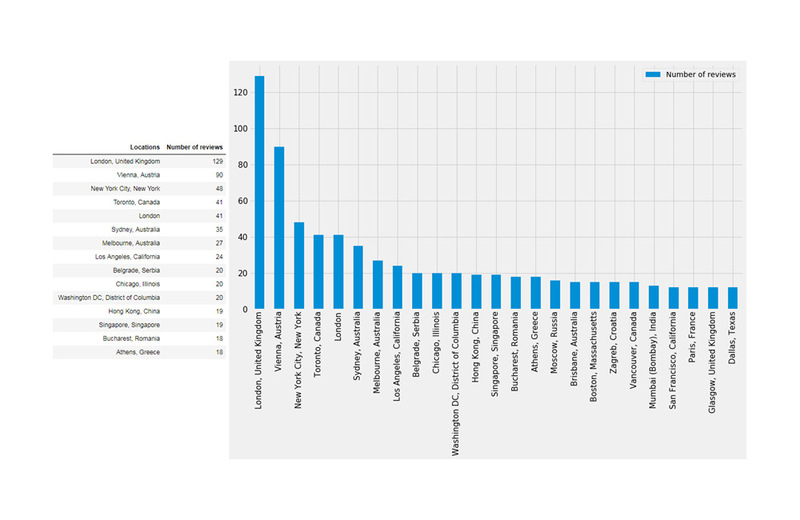 And by a little digging I mean analyzing over 3200 reviews using Natural Language Processing (buzzword for using algorithms to sort through text data – we do a bit of that around here). People love going to the museum for different reasons. But they do love going to the museum. We’ve got our first insight when we visited the museum (surprising, right?). 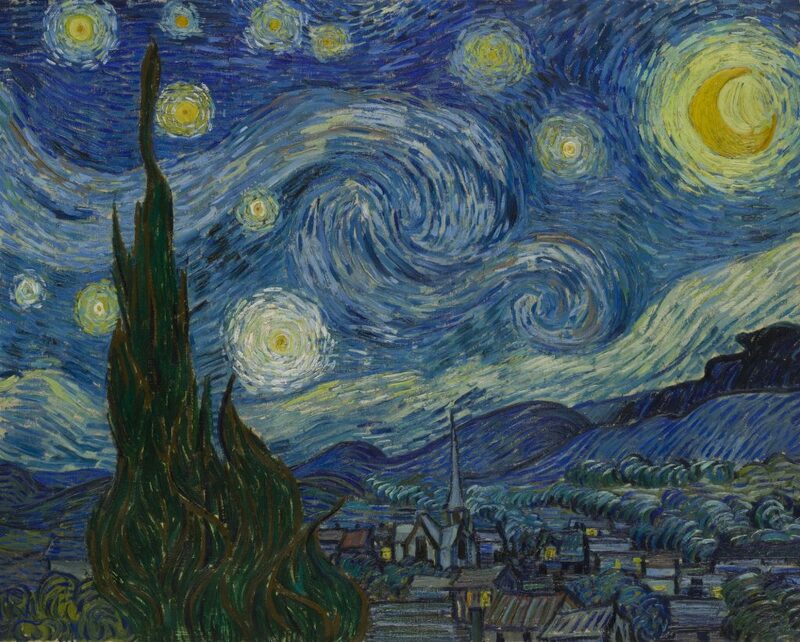 There’s no algorithm to express the feeling of seeing people immersed in the works of art. Or children having fun by looking at a statue, a Bruegel painting or a crocodile mummy. Yes, they also have that. The second clue was when we discussed with Florian Pollack, marketing and communications manager for the museum. He mentioned that many tourists would, unfortunately, miss the museum while visiting the Museum of Modern Art or the Natural History Museum. But those that visited the museum were in fact “overwhelmed and impressed” by what they have discovered. So we decided to test that. 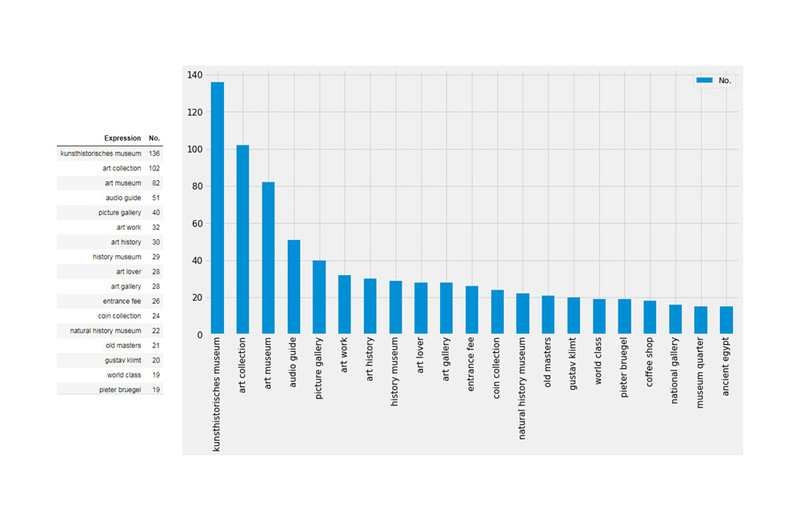 We analyzed the review data and found this: the data showed people loved the museum. Ticket buyers where the best evangelists the museum had. We noticed a 96% positive sentiment among those that reviewed their visit to the museum. 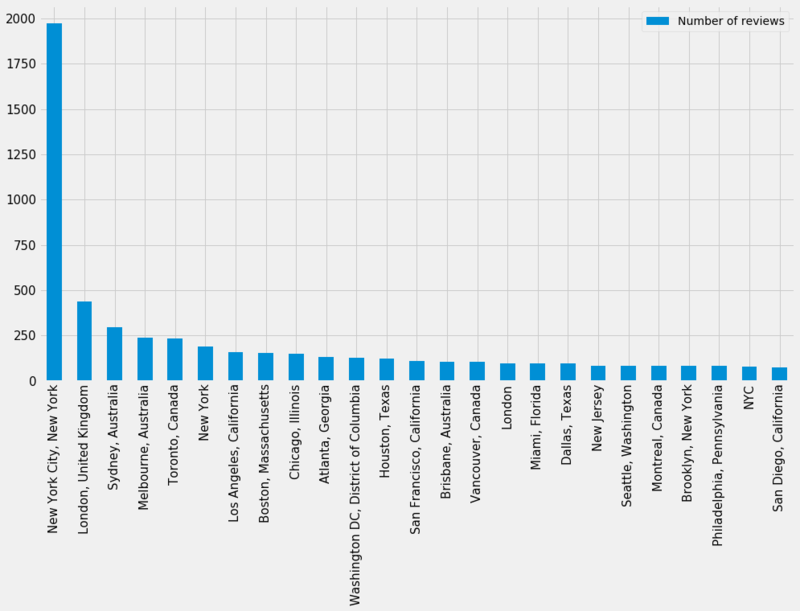 Where are the museum ticket buyers coming from? 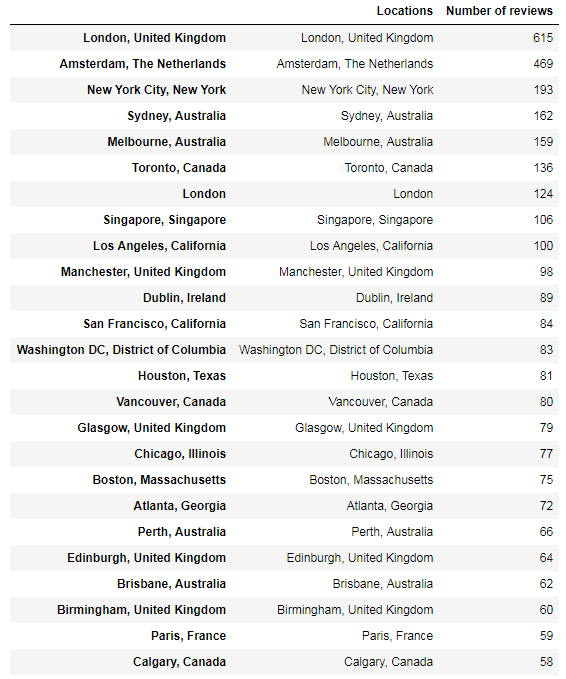 Top three cities that buy museum tickets: London, Vienna, New York. However, the long tail was quite long, we noticed. People came from all around the world and they loved their experience. So what exactly where they more interested in? 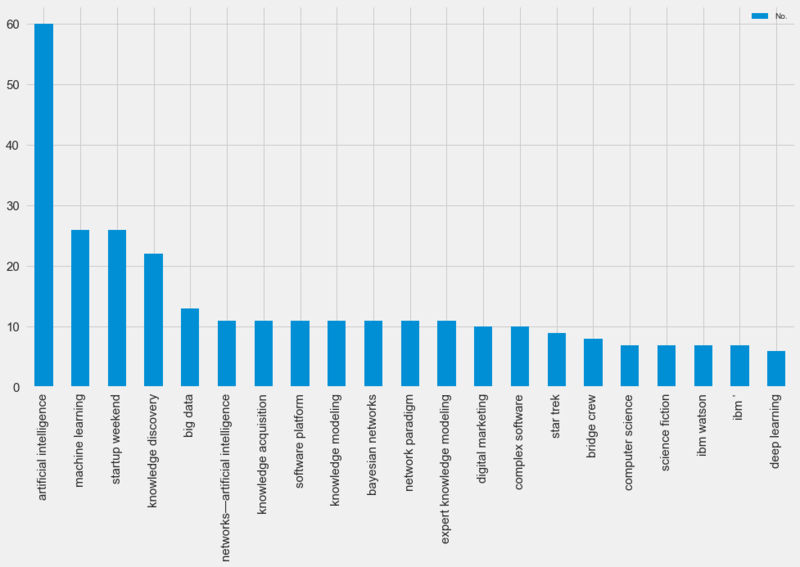 What are people most interested in when visiting a museum? Art: people were interested in the art collection, the art works, art history and art gallery. Basically – people are going there for the art. They were mentioning the audio guide as a great resource and among the most interesting works where the coin collection, old masters works, Gustav Klimt’s work as well as Pieter Bruegel’s. 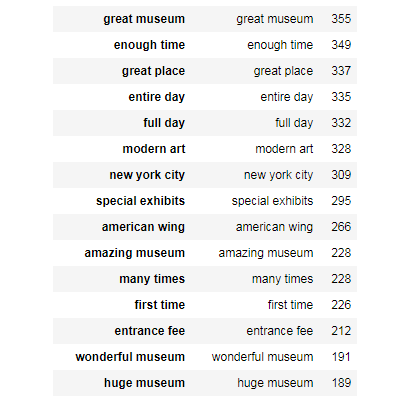 These three museums had a combined 68211 reviews so this turned into a bit more than a side project for a blog post. Visitors to the Rijksmuseum love the Night Watch, Rembrandt, Van Gogh, the gift shop and the coffee shop. 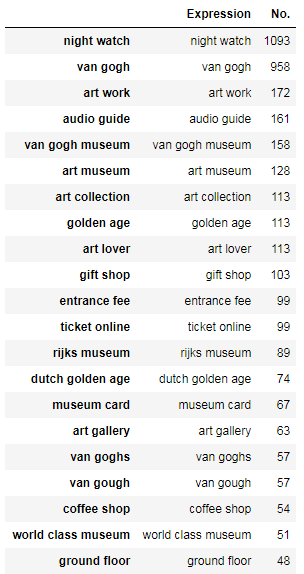 Oh, and they want to buy museum tickets online. The Rijksmuseum hosts more than 8000 works that tell the story of 800 years of Dutch history so visitors’ opinions were quite different. However, some common threads did pop up on our research. 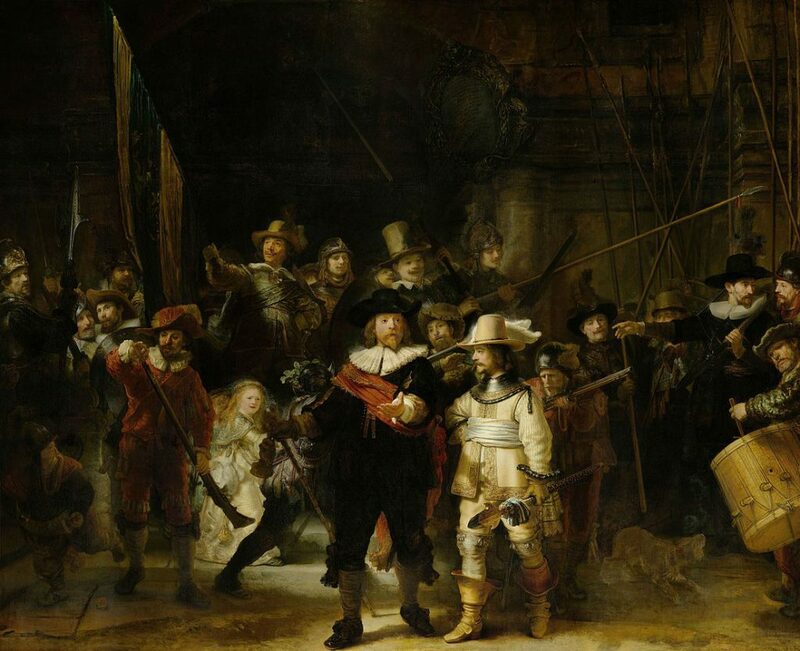 While studying the reviews we noticed (it was kind of hard to miss it) the most loved item in the museum’s collection: The Night Watch. The work was finished in 1642, when the Dutch Golden Age was at its peak. That’s why you will see “Dutch Golden Age” as one of the hottest topics. 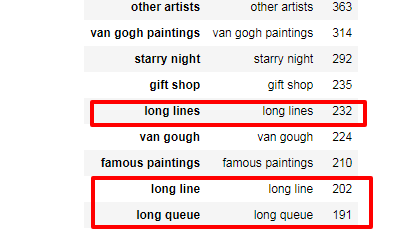 If you wanna get a preview of the painting, before deciding on whether you should visit the museum, the Rijksmuseum has all the info ready for you to preview. Fun fact – you can also see Obama visiting the museum and its most famous painting, in the preview page. Basically they love art. But they also love some of the other things the museum has to offer, and I might say that The Rijksmuseum is quite an avantgarde museum, building experiences around its works of art. People also come there for the high-quality audio guide, the wonderful gift shop and its coffee shop. Before they visit they are interested in the entrance fee, buying tickets online and the museum member card. So if you manage a museum – you might take note of this. 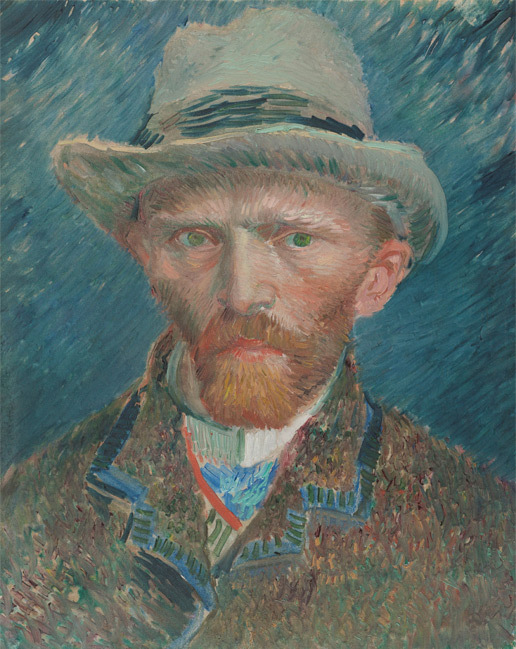 Visitors who buy museum tickets to the Van Gogh Museum = Rijksmuseum visitors. But they are looking at different things. Visitors are also interested in the gift shop and buying tickets online. So that topic again. 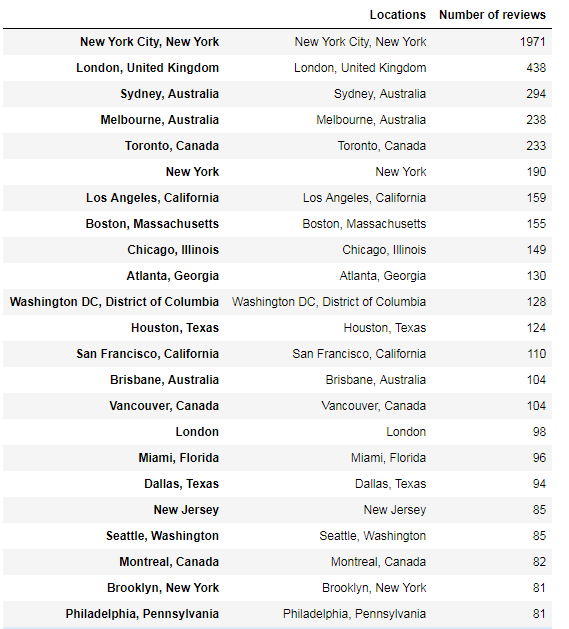 As you can see most reviews come from New Yorkers, followed by visitors from London and then Sydney and Melbourne. Apparently, EU visitors are not really interested in visiting The Met, and if they are, they are a bit shy about it. So – that’s the end – four great museums and 65 000 reviews later I can surely say that people do buy museum tickets. Each museum has its own stars and people are attracted to these culture stars. Visitors love to spend time enjoying the museum experience and they want to purchase mementos of these visits. They are interested in buying their tickets online, spending enough time within the museum and enjoying unique works. Oh and by the way: it helps to have a cafe. Do you use email marketing to promote your events? Learn how to increase the open rates. “…timing is an art”. And fortunately, with email marketing, you can become a real artist. Email marketing services help you gather relevant information about your subscribers, information that will help you contact them at the right time. Find out their time zones (you can add this into the registration forms, so every subscriber will enter the preferred time zone) and send emails accordingly. When speaking about open rates you will see that there are some days and some hours that perform slightly better, but I strongly recommend testing to see what works better. p.s. The best way to see what works and what doesn’t is to use some A/B testing for subject lines, sending the same email with two different subject lines. Your subscribers will help you out. Don’t use long subject lines as more than 50% of emails are opened on mobile devices, devices that will cut down the displayed length of the subject line. It’s fine to use shorter subject lines as they just need to provoke the interest of your subscribers. Don’t over-communicate within subject lines, just do your best to make people interested in what’s inside. Sell the sizzle, not the feature. In other words, you must concentrate on your subscribers, not your products/services. What ‘s important for them and how will you help them achieve what they want? If you plan a conference tell your subscribers what they will learn if they attend (this is what really counts), not that you have a 20 years experience in the event planning industry. p.s. for example when talking about a cashless payment system (based on NFC technology) we know that the benefits are: less time in queues, no more fraud, increased order value and more…so we don’t start talking to our partners about the communication protocols (until after they see how NFC can help them). Add a personal touch. Generic email addresses tend to make us lose interest, so try to use your personal email to send information. Although technically speaking you send a newsletter, a no-reply email address will make things difficult for your subscribers that want to get in touch. Take this “risk” of using the email address of a real person and you will see an improvement in the engagement of your subscribers. We use this method here at Oveit and I can confirm that you will see an improvement in no time. Don’t get spammy. 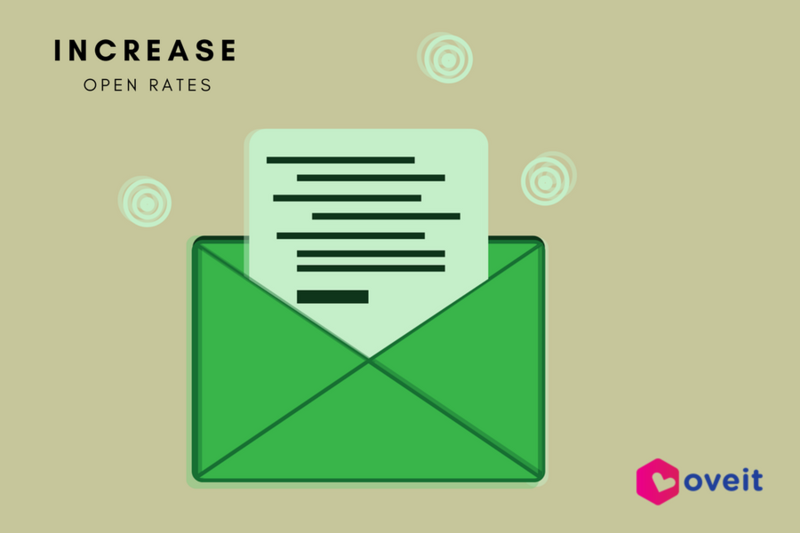 If you search information about ways to improve open rate of your email you will find many great bits of advice from countless professionals. As you probably already know people react to scarcity (it’s one of the six big principles of persuasion from doctor’s Cialdini famous book) and you will find many articles encouraging you to use the ideas of urgency and scarcity to convince people to take action. But be aware that is a very thin line between a great subject line that involves urgency/scarcity and a spammy one. And if you use it (in some cases you must apply it) don’t go “the tabloid way”: LIMITED TIME! OFFER EXPIRES IN X HOURS doesn’t sound like a professional way to announce that your early bird offer will expire, especially if we talk about a premium business conference (and also can trigger some spam filters – read more here). Although your subject line is very important because it influences your open rate is what you communicate to your subscribers that will determine their next action: will they respond to your CTA or will they unsubscribe from your marketing list? If you deliver what you promised (and offer useful information about your next events and one-time deals) people will have a reason to open your email (and give you some of their time). If you use spammy or misleading subject lines your subscribers will soon lose interest (not to mention that, in some countries, misleading subject lines are against the law). Newsletters are a great way to stay close to those interested in your events and convince them to attend. You can share information, promote special offers or ask for feedback. As said before, you are the sole “owner” of your subscribers’ list and this makes it extremely valuable for every event planning organization, no matter its size or budget.